January 31, 2013  We'll make you a deal. You solve this week's ScuttleButton puzzle and we'll let you stay in this country legally. 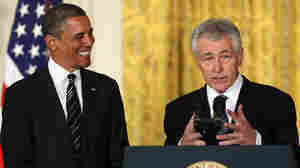 January 22, 2013  There was just too much happiness going on during Monday's inaugural celebration. What better way to sour your good mood than by checking out this week's ScuttleButton puzzle? 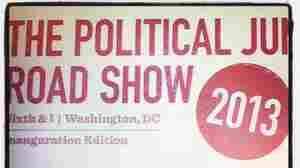 January 21, 2013  A "Political Junkie Road Show" in review: the interactive show met an enthusiastic crowd, with residents of the nation's capital gearing up for an atypical weekend of Presidential Inauguration. 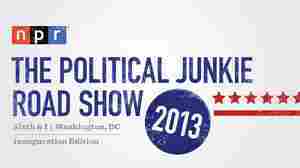 January 15, 2013  Destined to become one of the greatest events in the history of our nation's capital, the Political Junkie Road Show takes place before a live audience on Wednesday evening. In addition to everything else, there will be ScuttleButtons to solve. So why not practice with this week's puzzle? Have A Pre-Inauguration Ball: 'Political Junkie' Live Event In Washington, D.C.
January 11, 2013  Heard hilariously tackling America's true pastime every Wednesday on NPR's Talk of the Nation, program host Neal Conan and ad hoc "Political Junkie" Ken Rudin are breaking out of the studio for a live, pre-inauguration celebration. Join them at D.C.'s Sixth & I, on Wed, Jan. 16 at 7 p.m.
January 8, 2013  Yes, we know, RG III got hurt and the Redskins are gone. But ScuttleButton is back! You gotta keep things in perspective. 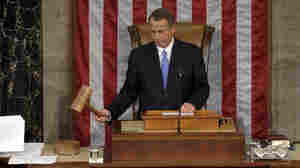 John Boehner Has Been Up And Down And Up Again. Where Is He Now? January 7, 2013  It's been a rough couple of weeks for John Boehner. 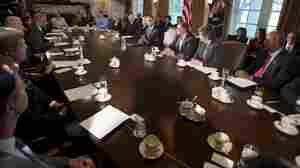 He was all but shut out of the fiscal cliff deal, dissed by his own party, and suffered 12 GOP defections when re-elected as speaker. But did he emerge from all of this as a loser? It's not that simple. December 10, 2012  The bombshell announcement by South Carolina's Jim DeMint that he will resign his Senate seat could lead to the first black senator from the South since Reconstruction. 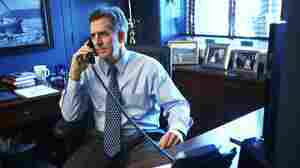 But how will DeMint's tenure be judged? December 3, 2012  You should solve this week's ScuttleButton puzzle NOW, rather than wait until after Monday's Giants-Redskins game, when it's likely a lot of my friendships will come to a sudden end.